Stilt walkers amaze me. You can’t help but notice them because they’re so tall. A “stilt” is a pole that allows someone to walk with his feet above the ground. A “stilt walker” is a person who walks on stilts. 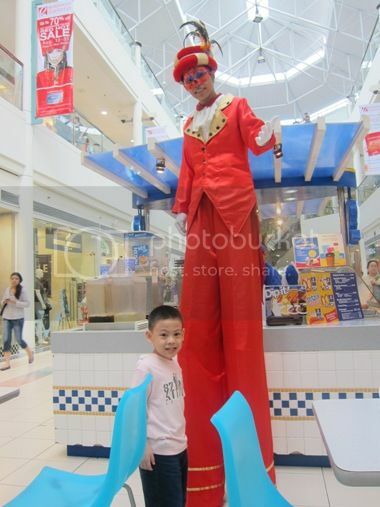 We saw a stilt walker at Robinsons Galleria when this mall was having its Red Hot Sale last year. Justin was delighted to see one, so I hurriedly took a picture of my son with the stilt walker for a souvenir shot. As the stilt walker went about his work, I couldn’t help but wonder how long he’s been walking on stilts that day, if he took special training to be a stilt walker, if he had actually been hurt while stiltwalking, and if he was enjoying what he was doing. While I envied the stilt walker for his height and wider field of vision, I bet there’s one thing he couldn’t do: to bend and marvel at the lovely items beautifully displayed in a jewelry showcase in one of the jewelry shops at the mall. That is something I can do anytime, and that’s exactly what I did after our brief encounter with the stilt walker. This entry was posted in Stilt Walker, Stilts, Stiltwalking. Bookmark the permalink. I can already imagine how hard it must be to walk in those stilts! I don’t know how to balance myself so if that was me, I would have fallen down. I am always amazed too! they must be very well balanced in order to walk in that! I am also amazed with the stilt walkers. I think you need to balance rightly and focus when you are a stilt walker. i think i saw one in SM Baliuag just the other day, I just caught a glimpse of him from the table at Tokyo Tokyo where we are eating at the moment. Too bad the little man was not able to see it. I bet he will be amazed as I was! ← The Little Boy Went Trick-or-Treating!